The Greenwood trail is located in the Grand Mesa National Forest near Grand Junction, Colorado. The trail begins on top of the mesa in the Flowing Park area where it drops over the rim and descends onto a high bench that it travels down until it meets up with the Granby Road at Little Battlement Reservoir and comes to an end. As it drops over the rim it is crossed by the Mesa Top trail and near the 2 mile point it is met by the Bull and Brown trail. To get to the trailhead turn off of Highway 65 onto the Lands End Road. Follow the Lands End Road for 1.2 miles and turn south onto FR #109 towards Flowing Park. Continue on FR #109 for 3.6 miles and turn left onto 109.2D. It is about a half mile down 109.2D to the Greenwood trailhead. Passenger cars and low clearance vehicles may want to park at the turnoff and begin from there. The road can become impassible when wet even for 4-wheel drive vehicles. There are quite a few primitive campsites between the Lands End Road and the Greenwood trailhead that can accommodate both tents and RV's. Before traveling 400 feet the Greenwood trail is crossed by the Mesa Top trail. The trail has a bumpy start as it goes over some outcropping rocks but it quickly smooths out as it continues down the side of the mesa. A trail squeeze comes up that restricts the width of OHVS to 50 inches or less. Aspen trees begin appearing as the trail begins leveling off. The elevation changes are exaggerated in the trails profile due to its relatively short length but it shows that after an initial drop of 150 feet or so there is a little climb followed by a long gradual descent. The hill at the end is between the Bull and Brown trail and the Granby Road. As far as getting up and down the mesa the Greenwood trail is probably the easiest of all the routes. As the trail alternates between dark stands of spruce and bright groves of apens it also varies between smooth running dirt track and rocky stretches. For the most part the rocky stretches don't get all that rough. A few nice open meadows where the wildflowers flourish allow for more distant views. Near the 2 mile point the Bull and Brown trail branches off on the right. It is also open to OHVS that are 50 inches in width or less. After passing the Bull and Brown trail the route regains about 100 feet of elevation and then gives it all back as it drops down to where it ends at the Granby Road. The Greenwood trail and the Granby Road meet up at the end of the Little Battlement Reservoir's dam. The Battlement and Granby reservoirs are stretched out for the next several miles along the Granby Road and are very popular with fishermen. 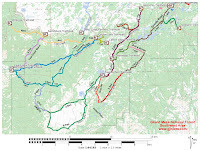 For this post we were doing the Greenwood trail as a big 16 plus mile loop that included the Bull and Brown, FR #110, Point Camp, Drop Off and Mesa Top trails so at this point we backtracked to the Bull and Brown trail to continue on our journey. 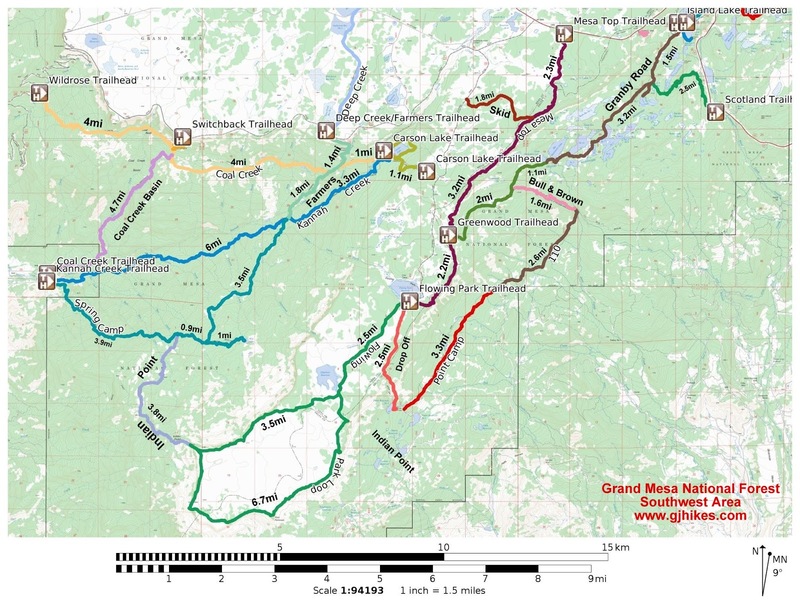 Whether you are hiking, horseback riding, mountain biking or enjoying some motorized travel the Greenwood trail makes for an enjoyable time on the Grand Mesa. If you would like to see it for yourself then all you have to do is 'Take a hike'.